Solarmeters are compact, handheld radiometers with simple pushbutton operation and NIST-traceable accuracy. They're proudly made in the USA. 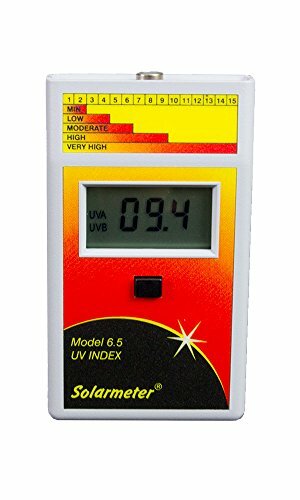 The Model 6.5 UV Index Meter provides instantaneous UV index measurement, and is also used for UV index comparison, monitoring reptile lamp intensity and aging, monitoring UV lamp intensity and aging, and UV index tracking over time. To operate your Solarmeter, aim the sensor window located on the top panel of the meter directly at a UV source. Press and hold the push-button switch on the face of the meter, and read the results in UVI on the LCD screen. For best results take note of the distance the reading was taken from the UV source in order to ensure repeatable results. A 9V battery is included, along with a rugged carrying case and Calibration Certificate. If you have any questions about this product by Solar Light Company, Inc, contact us by completing and submitting the form below. If you are looking for a specif part number, please include it with your message.